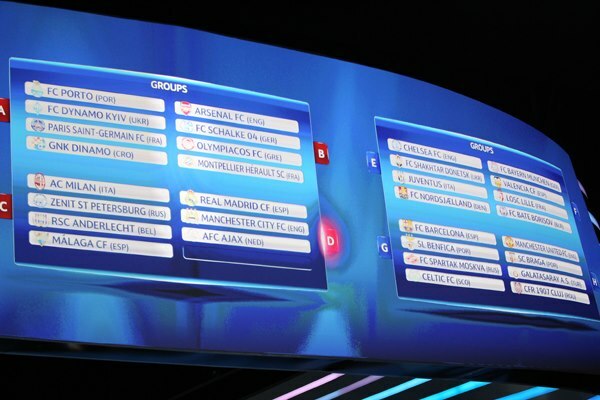 2012-13 Champions League groups revealed | Who's Playing Who? The Champions League groups for the 2012-13 season have been announced – and no matter what way you look at it, whether it’s D for Drama or Death – Group D is where it’s at. Joining La Liga champions Real Madrid are Premier League champions Manchester City, along with Bundesliga champions Borussia Dortmund and Eredivise champions AFC Ajax. That’s right, all in the one group. Wow. I have a feeling they all might be feeling a little hard done by. Manchester United have been handed a much kinder draw, with Braga, Galatasaray, and CFR Cluj joining them in Group H. Although after the disastrous 2011-12 CL campaign, they won’t take any side lightly. Chelsea and Arsenal also have fairly reasonable groups, as have Barcelona. Are you happy with your side’s draw? Or are they going to be up against it trying to progress from this stage?